For simplicity’s sake, I’m going to assume that you, dear reader, are also familiar with the Revolutionary War but perhaps are not deeply entrenched (see what I did just there?) 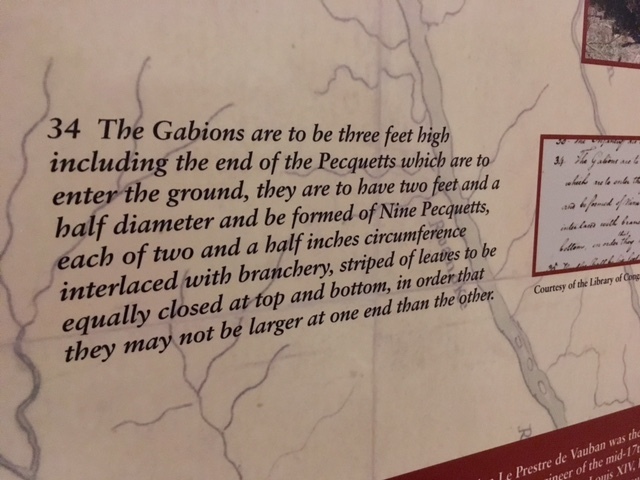 in the details of the Yorktown battle. It’s October 1781. The war has been raging for the past 6 years. France has been an ally to the American cause against the British for the last several years. 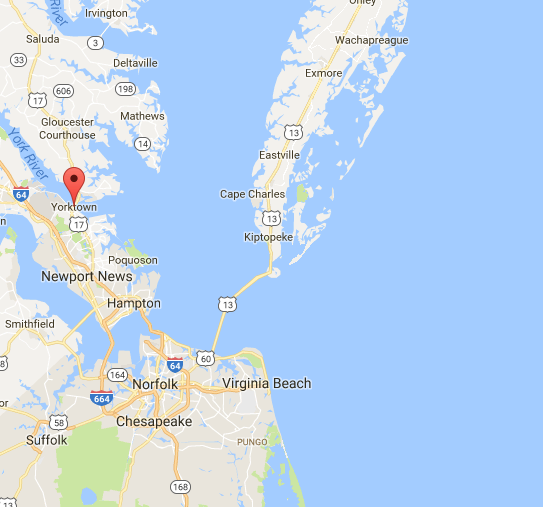 The British have positioned themselves in Yorktown and established a defensive barrier before them with the York River at their back. British ships bringing supplies and soldiers are generally able to come and go from the harbor. However, the French have arrived and blockaded the way with their own ships while the French and American soldiers make their way from New York down to Yorktown. The British army believes that they will soon receive aid in the form of additional soldiers. This information proves to be false and the combined efforts of the French and Americans overtake the British, forcing their surrender. 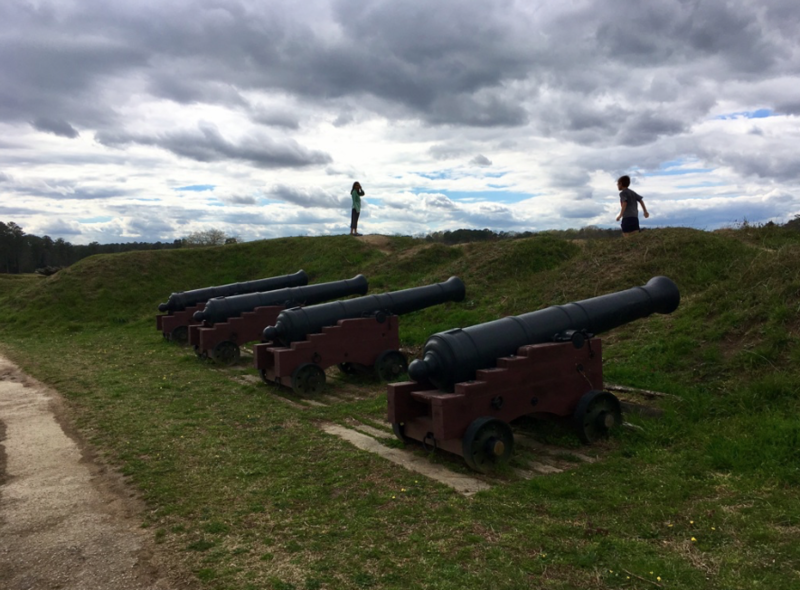 Although the war does not officially end for another year, the Yorktown battle is pivotal and becomes the last major battle fought during the Revolutionary War. Now that you have the overarching scope, let me zoom in and focus on one particularly intriguing aspect within this battle–gabions. 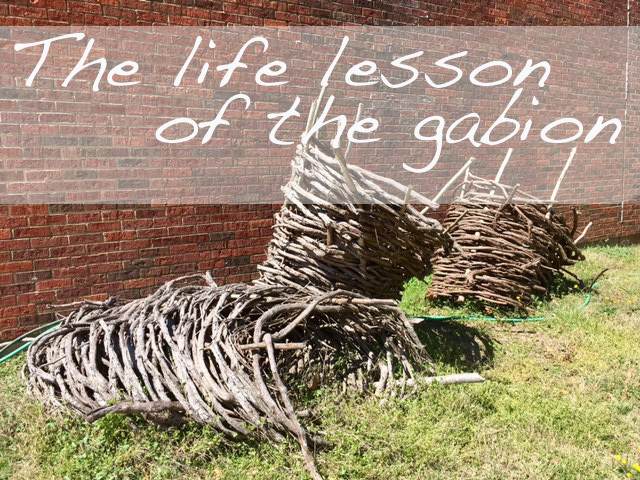 A gabion is a uniquely crafted bottomless basket with an exclusive purpose. 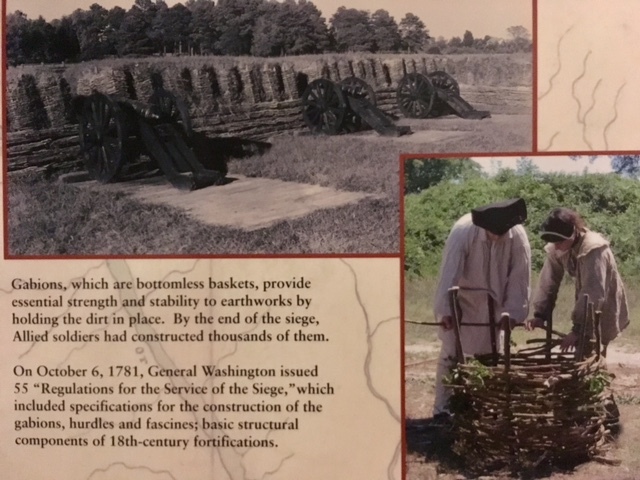 When filled with rocks and soil, these large woven baskets aid in the rapid building of redoubts (temporary fortifications) and earthwork barriers during battle. Resisting the problematic potential of erosion during a rainstorm, these barriers retain their shape and support. In addition, gabions are portable allowing them to be constructed ahead of time and moved to the needed location for filling and erecting. Most fascinating to me was learning that construction of one such “battle basket” requires one day of labor. Thousands of gabions were used during the battle of Yorktown. That knowledge puts into perspective the extreme foresight required to utilize these in combat. One does not impulsively decide to employ the use of a gabion added fortification. Gabion baskets represent advance planning. In life it may take years of consistent, daily weaving before you begin to realize the fruits of your labor. However, with faithful focus the fortification will be built in due time. Perhaps you have young children. 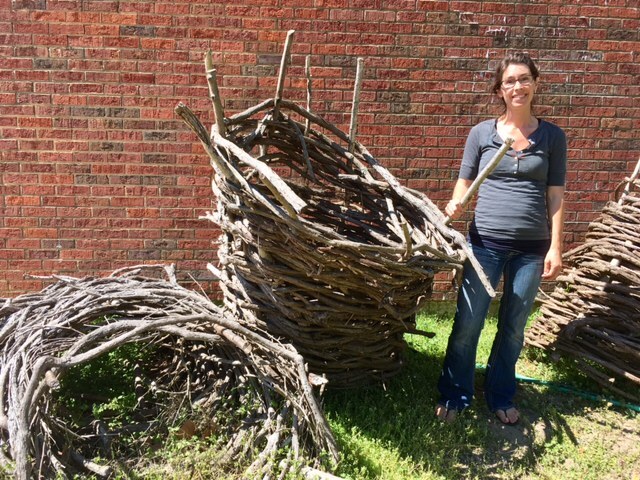 Every day you have a new opportunity to weave a basket. Over time, these baskets will be filled with the rocks and soil of truth and purpose. Resisting erosion, they will have a firm foundation. Maybe you are married. Are you weaving a basket toady ready to fill with fortifying words and deeds? The world seeks to undermine the value of faithfulness. Your baskets are an important stronghold. Likely you have a goal. You want to write a book, travel somewhere or develop a new habit. Each day is a fresh chance to build the wall that could change the landscape of your life. The beauty is in the simplicity. We are all gifted with tools required for construction. The complexity comes in the consistent repetition required. Perhaps it is good to remember that no soldier was weaving in the forest alone. Do you have a mentor, coach or accountability partner? Are you surrounding yourself with the people who will weave with the same fervor and purpose? Furthermore, no one was asked to weave without instruction. You don’t have to do this alone. Ask for help. Seek advice. Pray. If any of you lacks wisdom, let him ask God, who gives generously to all without reproach, and it will be given him. But let him ask in faith with no doubting. For he who doubts is like a wave of the sea that is driven and tossed by the wind. Together let’s weave until our hands have built up the calluses of repetitive action and our arms are strengthened with the endurance needed to finish well. And let us not grow weary of doing good. For in due season we will reap if we do not give up. The Jr. Ranger booklet for the 11+ kids is a little harder than some of the others we have done as it includes some math and quite a bit of investigation (depending on which activity pages your child chooses). They have the option of a wooden badge or patch at the end. Much of the battle site is explored via car. We opted to purchase the CD audio tour from the gift shop for about $5 and were very glad we did. It offers the perspective of the battle from more than one person’s perspective and we all enjoyed it. The CD description says that it takes about an hour to do the drive. However, we stopped and got out at almost every part of the tour to let the kids run and play. Consequently, it took us a few hours from start to finish. How about you? What basket are you currently weaving? Recently, I’ve been working on developing a habit of regular exercise. I’ve been consistent for 4 weeks now which feels like a major milestone! I invite you to check in with me and see how I’m doing in this area in the future. 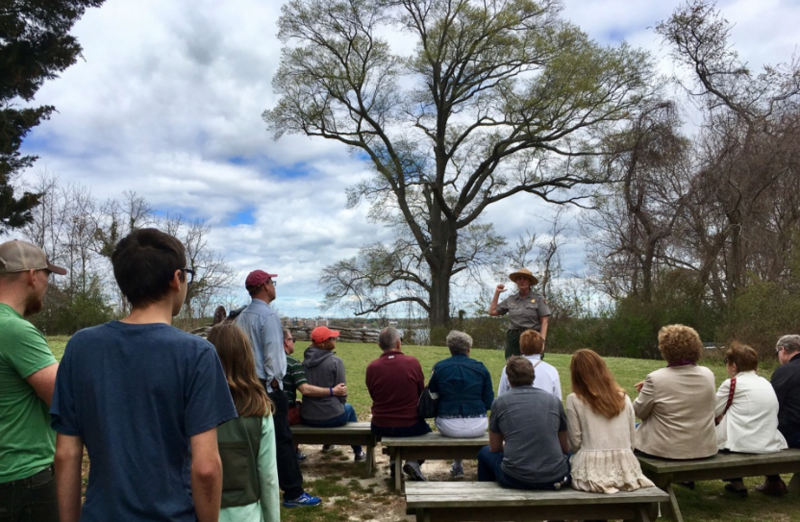 When you visited Jamestowne and Yorktown, did your family work on the junior ranger program? I have not been to those two sites in four years, but they only handed out junior ranger patches then. Do they now give out badges? I recently saw a junior ranger badge from Jamestowne, and this would be new. Hi Todd, Yes we did work on the Jr. Ranger program at both Jamestowne and Yorkown. They now offer the option of either a wooden badge or a patch upon completion of the booklet. The wooden badges are very nice looking and 3 of my 4 kids opted for the wood badge. As a side note, the Yorktown booklet for the older kids was one of the slightly harder ones they have done. Great article. I love the historical context- and yes- far too many people wait until the kids are gone or they’re reaching the end before they start noticing or care about the basket they’re weaving. Thank you David. You are right, that is indeed a sad time to reflect on your life only to discover that the time has run short. HA! Great play on words Shelly;)! Thank you for your kind comment. I love knowing you on on the other side of the screen reading. Blessings to your whole family! I love you application! I have been thinking about this a lot lately and formulating a post in my head about watching my children go into adulthood and carry on some of the passions I had when I was younger. 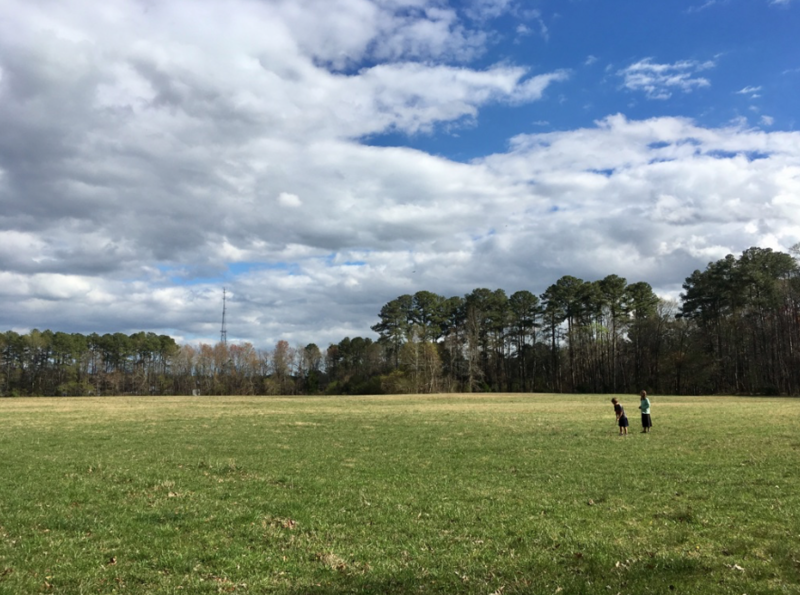 There are so many things that I had to let go of just to take the time to raise kids, and now they are picking up the batons and becoming experts in things I only dabbled with. It’s like multiplication. 🙂 Very fun to watch. Thank you Angela. I’d love to read your perspective fleshed out in a post. It’s so inspiring to hear from your angle of parenting with kids that are aging into adulthood! I can only imagine how fun it is to watch. Do you think you can jump in now again with any of those things you previously dabbled in or is it not yet the time?